International organizations already deliver training at a massive scale, but they do it mostly the old-fashioned way – one workshop at a time. The urgency of scaling up learning, education and training (LET) is real: with 320 million people affected by climate change-related disasters in 2015, 30 million deaths from non-communicable diseases (NCDs), and many more such grim numbers, it is clear that the challenges need to be met at scale. MOOC now, not later: Sheila Jagganathan is Senior Learning Specialist and Program Manager of the World Bank’s e-Institute. On January 27th, the Bank launched its first MOOC on the Coursera platform with 10,000 participants. Based on a global report published in 2012 that asserted “a 4°C warmer world must be avoided”, it aims to discuss the “main policy choices needed to prevent warming above 2°C”. Given the content source (a report), format (4 weeks, rather than a university-style semester) and informal title (“Turn down the heat”), could this be a new breed of MOOCs? Why and how did the World Bank Institute, which already manages a successful distance learning program using the Moodle platform, engage in this new space? 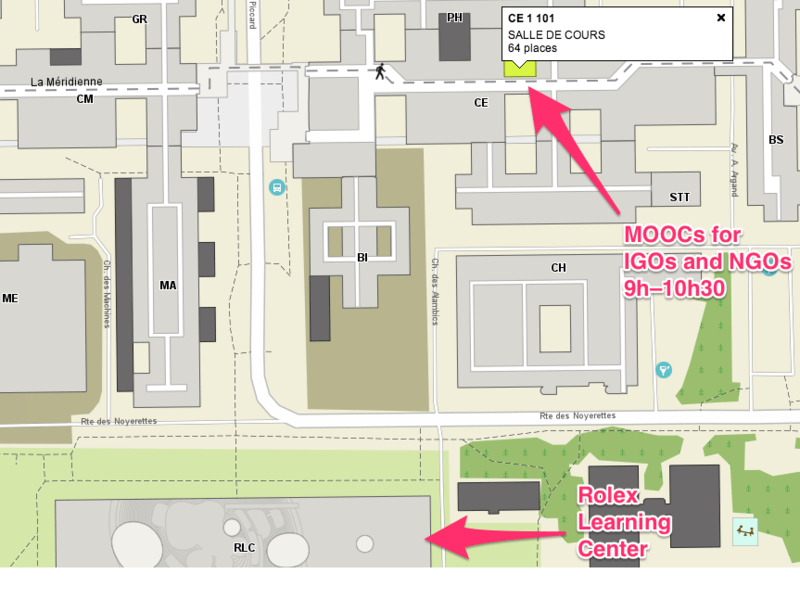 Road MOOC: How does an organization decide to engage in developing a MOOC? Patrick Philipps heads the International Road Union’s Academy, the only global body dedicated to road transport training. Patrick will share the process through which he became interested in MOOCs, the criteria considered in choosing a partner, and the ongoing analysis and decision-making steps that may or may not lead IRU to produce an accredited MOOC with a university. MOOCs for development? UNCTAD’s TrainForTrade team are long-time believers in e-learning, using educational technology to support capacity-building efforts. Distance learning officer Dominique Chantrel will describe the e-learning efforts of his organization, and examine whether MOOCs offer solutions for training in developing countries.